Six men in a seat. by Bill Hannan, December 2007. As we drew close to the federal election, the nature of representation in the Melbourne electorate took on a fresh interest. ABC psephologist Antony Green called today's Melbourne a very safe Labor seat. That seems fair enough. At the previous election, Lindsay Tanner won all 36 booths. His lowest winning margin was above 60 per cent and the highest 85.5 per cent (at Buncle Street in North Melbourne). In effect, Lindsay Tanner continued a tradition dating back to 1904. For more than a century, every member for Melbourne has come from the Australian Labor Party. In receding order before Tanner, the members were Gerry Hand, Ted Innes, Arthur Calwell and Billy Maloney. Curiously, three of the five have been ministers or shadow ministers for immigration. Calwell was the nation's first minister for immigration and oversaw the great postwar program of European immigration — when White Australia still applied. Gerry Hand was closely identified with Australia's hugely successful policy of multiculturalism, abandoned emphatically by the Howard governments. U.E. (Ted) Innes, as he is always listed (the U stands for Urquhart), was shadow minister for immigration during the years between Chifley and Whitlam. The very first member for Melbourne after federation was M.D. 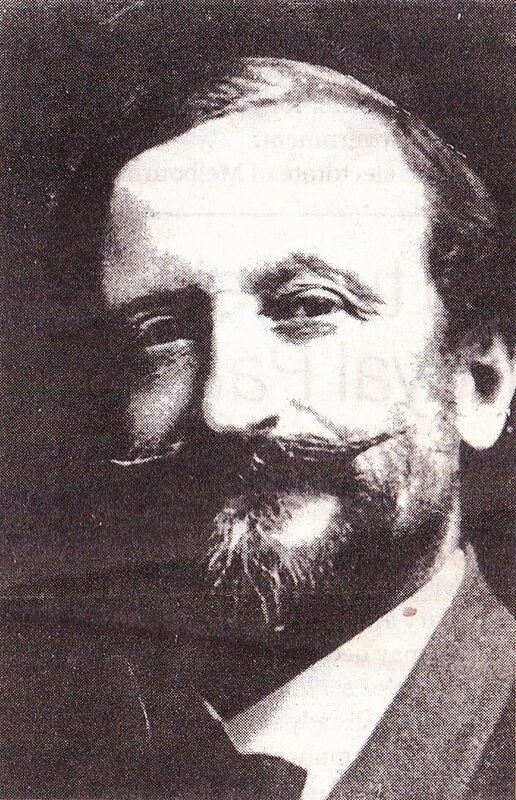 McEacharn, who held the seat from 1901 to 1904. McEacharn ran as a Protectionist. The Protectionist affiliation looked back to 19th-century politics, but in 1901 it was still the issue that made Victoria distinct from New South Wales. Since these were the two major colonies in the new federation, Victoria's Protectionists and NSW's Free Traders were the basis of the main contending parties. The political divisions that coloured North Melbourne's politics in the 19th century had a Protection versus Free Trade dimension but were mainly a power struggle between old landowners, firmly ensconced in the colony's Legislative Council, and liberal reformers inspired by democratic ideals or their own business interests. Bits and pieces of 19th-century politics linger in our street names and some old pubs. The Peacock, now the Court House Hotel, was the scene of many meetings and schemings, and campaigns were run from there and other pubs. Debates and speeches on local and international issues were held in the town hall or the nearby Temperance Hall (now the Legion of Mary). The Errol and Queensberry street corner was popular with agitators; and down the street a little, Brettana Smyth ran a family planning and women's rights movement from her shop. At the western end of the district, Haines, O'Shanassy and Laurens streets recall two premiers and a councillor. The councillor, John Laurens, was also an MLA. At the time, it was common for men to hold both positions simultaneously. Premiers Haines and O'Shanassy respectively represented the divide between Protestants and Catholics, a major division at a time when political groupings were ad hoc and shorter-lived than religious and ethnic loyalties. Up the hill from these streets are Chapman Street and Costello Lane. Both have distinct political reference. 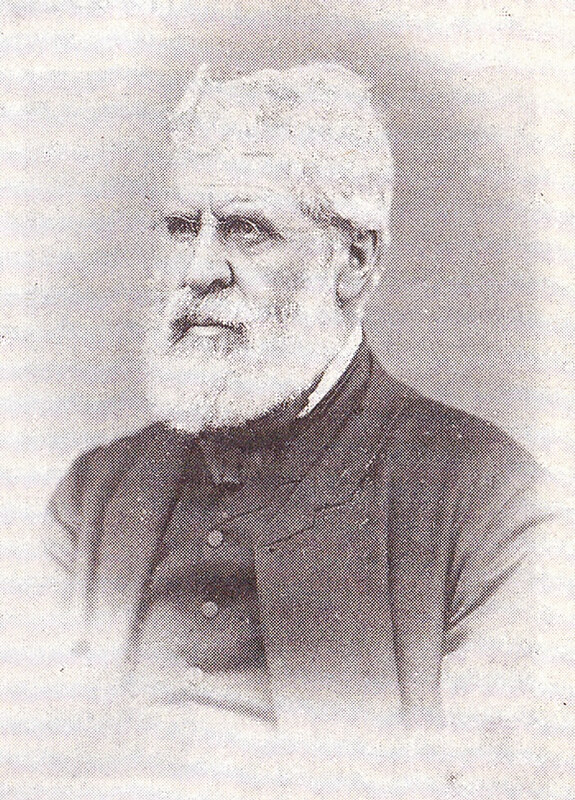 Chapman Street has its name from Henry Samuel Chapman (1803-1881). Described in the Australian Dictionary of Biography as a "judge, colonial secretary, attorney-general and Philosophic Radical", Chapman was a political activist in England, Canada, New Zealand, Tasmania and Victoria. In England, his pamphleteering anticipated the Chartists (one of whom, Charles Don, would turn up agitating for the working man in North Melbourne and Collingwood) and as an editor he worked with philosopher John Stuart Mill. Whilst he was colonial secretary of Van Diemen's Land from January 1852 Chapman wrote Parliamentary Government; or Responsible Ministries for the Australian Colonies (Hobart, 1854). He was dismissed in 1854 over refusals to implement transportation, and successively knocked back offers to be governor of the West Indies, and treasurer and secretary of Victoria. Instead he practised as a barrister in Victoria. As a member of the Legislative Council in Haines's time, Chapman established his lasting claim to fame by drafting legislation for voting by secret ballot. 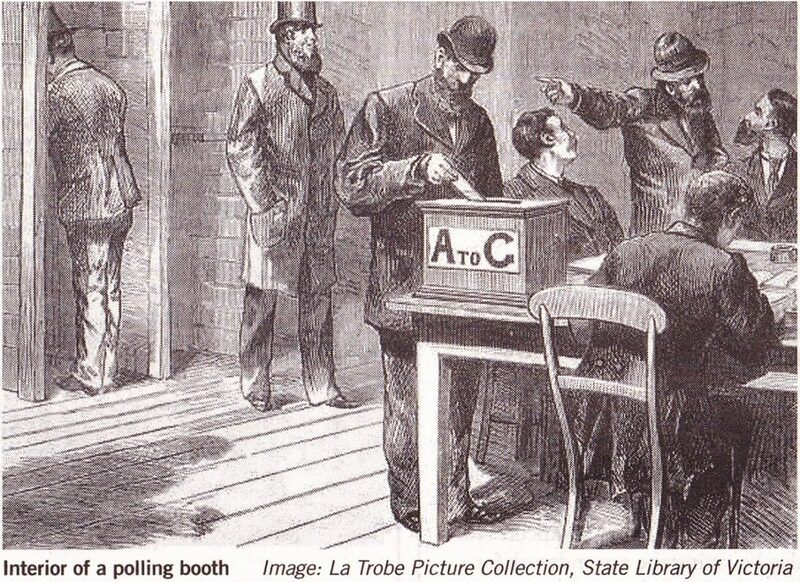 The 'Victorian ballot' was the first of its kind in Australia and was followed in a few weeks by Boothby's legislation in South Australia, which eventually became the manner of voting in federal elections. As we entered the cubicles to mark our papers and put them in the ballot boxes we might have spared a thought for Henry Samuel Chapman. Costello Lane recalls the dubious political achievements of Patrick Costello, ancestor of former treasurer Peter Costello and World Vision's Tim Costello, who lived on that corner and agitated to have the lane paved. Patrick was an Irishman and Catholic but the family later turned Protestant. He arrived in Melbourne in 1840, became an innkeeper, a Melbourne city councillor and in August 1861 MLA for North Melbourne. He had been in parliament only three months when he was expelled for rigging votes in a Mornington. by-election. Heather McKay in Men of Hotham writes that the electoral scam "involved persons impersonating voters who had left the area or had died, to elect a supporter of John O'Shanassy". Costello's squatter backers raised a considerable sum and he "hired a boat upon which 60 'substitutes' sailed down the bay". He was sentenced to gaol for a year, but got out after four months, remaining all the while a Melbourne city councillor. During the 1890s North Melbourne had moved considerably towards the causes of labour. It was a stronghold, then as now, of unions and much affected by the depression of the 1890s that polarised labour and capital. Before that, according to Sue Coffey in Hotham: Ethnic group and class structure 1855-1890, relations between unions and bosses had been relatively harmonious. As the gap hardened, however, North Melbourne saw Labor candidates defeating the older liberal reformers, and the town produced notable Labor leaders in George Michael Prendergast and Dr 'Billy' Maloney. 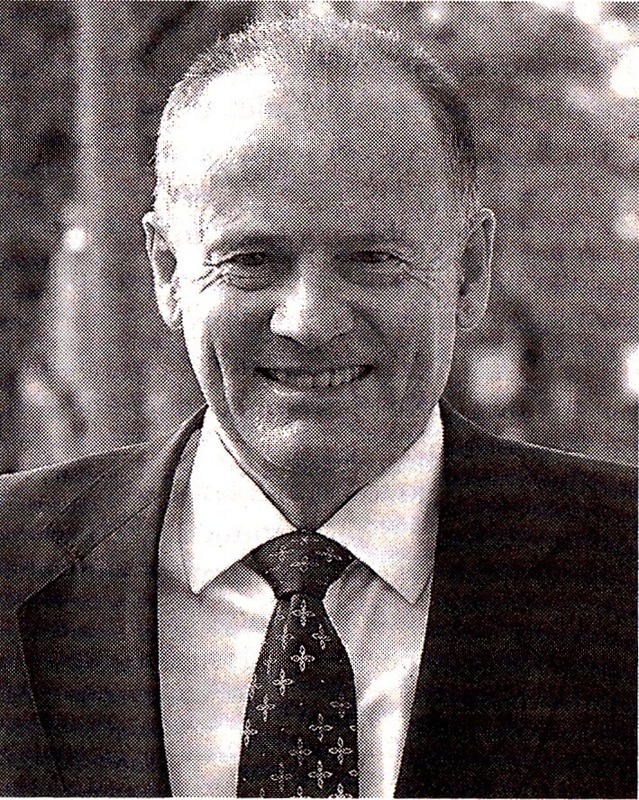 Billy Maloney was the first ALP member for the federal seat of Melbourne. He entered parliament in 1904 and remained until 1940. His successor, Arthur Calwell, represented Melbourne for a further 32 years, until 1972 and without a break even though he had some slim margins when the DLP (Democratic Labour Party) was strong in this area. Calwell became a minister under Chifley and was later leader of the party in opposition. Maloney was probably too idiosyncratic to make it to cabinet despite his 36-year tenure. His achievements are memorable. He plugged away at getting women the vote until he succeeded. He supported Brettana Smyth's campaigns for women's rights. He administered free medicine to the poor and kept a herd of cows so that schoolchildren would have free milk. He was an initiator of Melbourne's May Day celebrations and, of course, thousands turned out for his funeral. Billy Maloney was the subject of a play by Bill Garner and Sue Gorr, performed in the North Melbourne Town Hall in 2005. 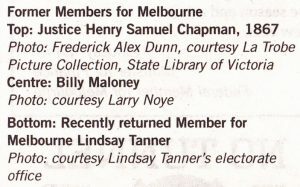 Politicians of the Victorian era are profiled in Heather McKay's Men of Hotham, for sale at the North Melbourne Library. There are some accounts of political life in Bill Hannan's Pride of Hotham, available from the library and from the Hotham History Project, and Sue Coffey's thesis Hotham: Ethnic group and class structure 1855-1890, held in the Local History Collection at North Melbourne Library. The astonishingly varied and productive political life of Henry Chapman was the subject of Trefor Owen's talk for the Hotham History Project on Tuesday 27 November in the North Melbourne Library.